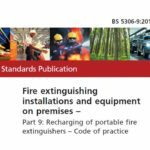 BS 5306 – 9 2015 Fire extinguishing installations and equipment on premises. 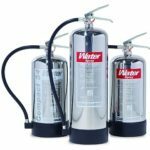 This standard amongst other things addresses a significant problem in the fire trade with the several hundred different extinguisher makes and types and sizes of extinguishers in commercial service the UK. Many extinguishers have additives to help increase performance or to extinguish a mixture of different fuels. Often servicing hundreds of extinguishers in a week, refilling and performing periodic discharge tests and refills, the onsite extinguisher technician cannot logistically carry each and every variant of type and size of original manufactures refills and in large enough quantities to cope with many different premises. BS 5306- 9 2015 allows for a “verified alternative” refill to be used, the performance of the verified alternative additive should match the characteristics of the original media used. The word “verified” means that a manufacturer of extinguisher media has stated the performance rating of his media when used in a same size extinguisher should meet or exceed the expected performance stated on the extinguisher. Our policy is whenever we cannot use an original manufacturers refill to use the best verified alternative media available when refilling your equipment, indeed we often supply better performance refills than in the original equipment specification. BS 5306-9 2015 also allows for the reuse of dry powder if suitable capture and sieving equipment is used during the process. We have this equipment and commonly use it when performing a five year discharge test and refill of ABC dry powder only. This means reducing the disposal of a imported chemical powder and a significant environmental saving. As part of the process of evaluating and providing alternative refills, corrosion inhibiting and non aggressive PH levels are considered and included both in the concentrate or in dilute quantities. If you see this label similar to the picture on the side of your extinguisher it will have a verified alternative refill. In order to provide traceability for this, the label states the independent refill manufacturer and product code, together with the technician and date. To assist with ensuring you have full information of the media characteristics either for medical reasons or to help you with ensuring extinguisher media does not conflict with any substances or precious items in your premises please see below a list of the verified refills we use together with the Safety Data sheets and Technical information. 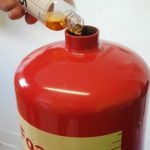 To find out more about our selection of manufacturers refills we commonly use for extinguisher stock please visit https://www.extinguisher.com/fire/free-downloads/. Please note Carbon Dioxide is not specific to any one type of extinguisher and is always generic.